Rarely available to let, a fine example of these handsome Ashchurch Grove family houses with their lovely west facing gardens that back onto Ashchurch Park Villas. This property has been superbly finished throughout and extended to provide a fabulous modern conservatory kitchen opening onto the garden, where there is a useful cedar clad garden office facing back towards the house. There is a formal double reception room with fireplaces and original ceiling plasterwork; on the first floor there are three double bedrooms, a generous shower room and useful utility. Then at the top a guest / master suite with fabulous green outlook and cleverly incorporated storage. Ashchurch Grove is a family orientated cul-de-sac within an area of architectural merit, protected by the Ravenscourt and Starch Green Conservation Area. Good local shops on Askew Road and Ravenscourt Park and tube station are within a short walk. As are numerous first class state and independent schools and the shopping and transports hubs of Hammersmith and Westfield. 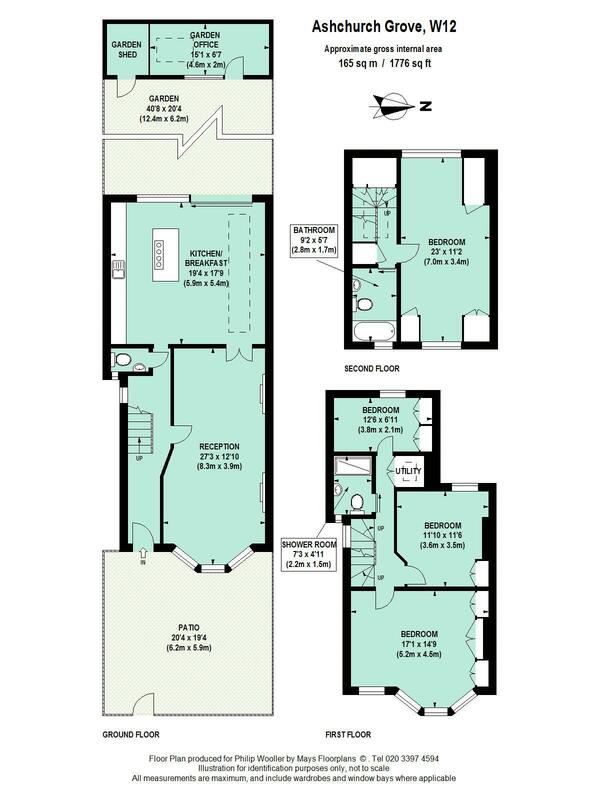 1776 sq ft / 165 sq m approx.